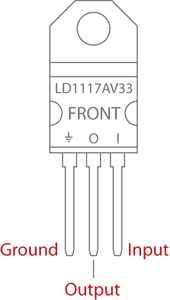 The LD1117AV33 is a low drop voltage regulator able to provide up to 1A of output current. The LD1117A33 is a low drop voltage regulator able to provide up to 1A of output current at a 3.3v fixed voltage. High efficiency is assured by an NPN pass transistor. Only a very common 10 μF minimum capacitor is needed for stability. Chip trimming allows the regulator to reach a very tight output voltage tolerance, within ± 2% at 25 °C. To use the regulator connect a voltage of between 4.45 and 10V to the input terminal and 3.3V will be provided on the output terminal. A heatshink is recomended when using over 500mA of current.